KW is a factory that was opened by the Turks in Guangzhou, China. 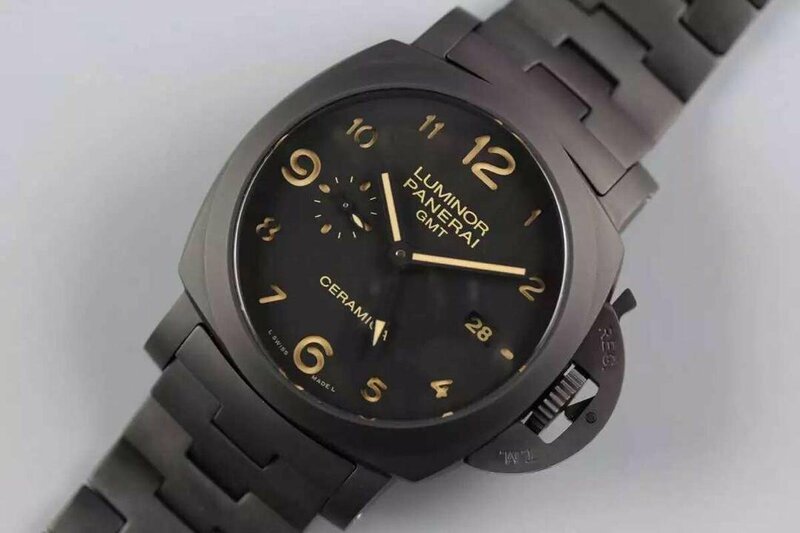 This factory specilizes in manufacturing good quality Panerai replicas, now there are a lot of PAMs replicas made by KW, including the PAM 441 replica I reviewed before, PAM 441 is a ceramic Panerai watch but it is not a full ceramic watch like PAM 438. 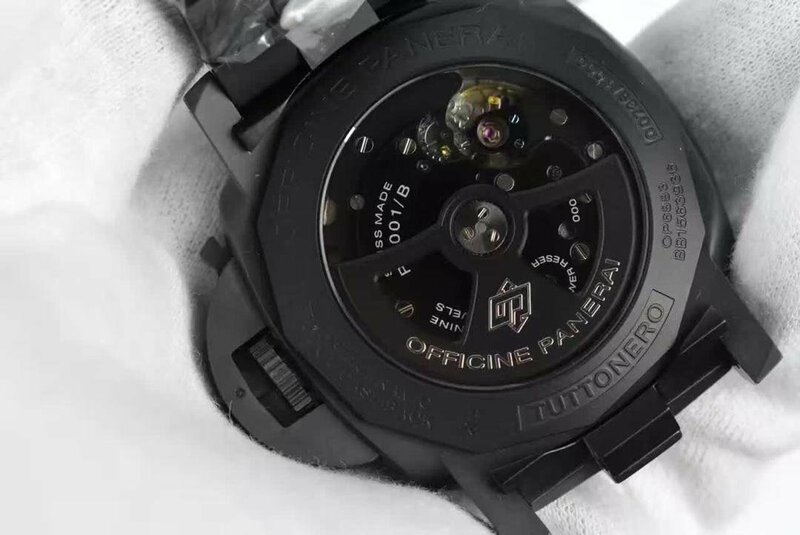 KW PAM 438 is replicated according to genuine watch, the size and other details are all 1:1 cloned, you can not find too many flaws on this replica. When I first had this watch, it feels a little heavy, the watch weighs about 115g. 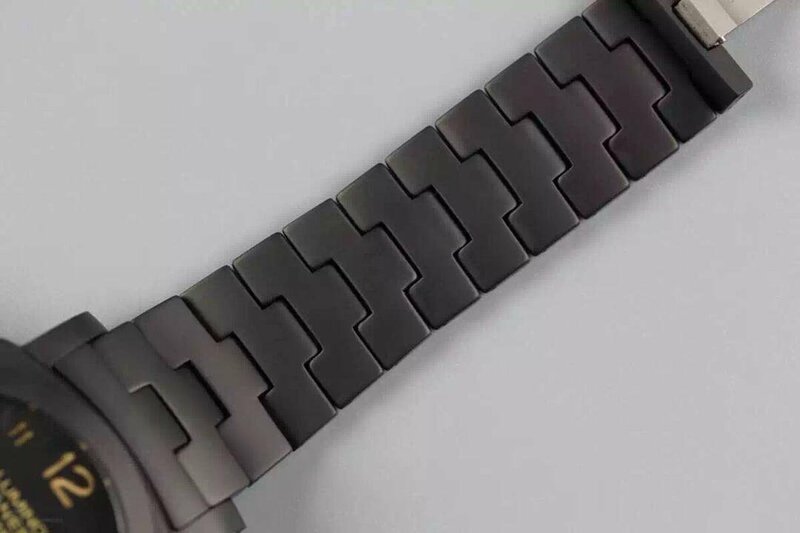 I feel its high quality texture but its ceramic material makes it lighter than other PAMs made of stainless steel. In my opinion, ceramic has a lot of advantage, such as refined texture, scratch resistance and not fade. 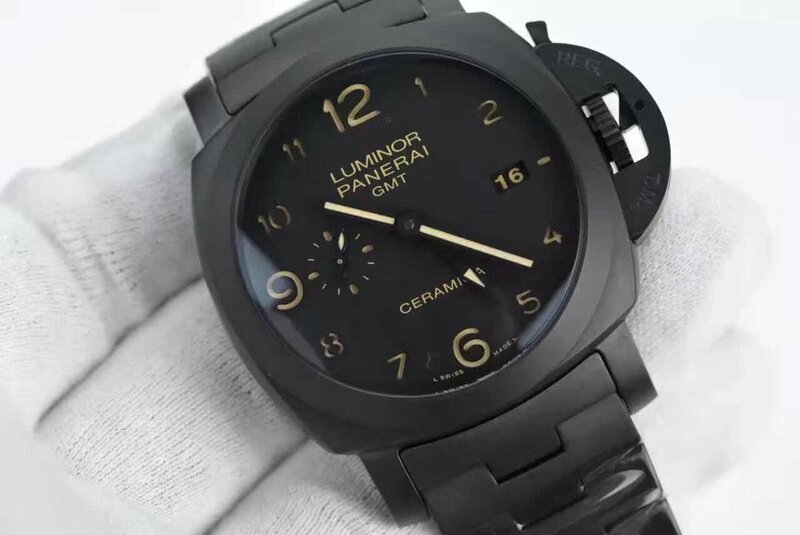 PAM 438 is 44mm in case diameter, like PAM 441, the bezel, case head and case back of PAM 438 all use screw-down structure, this will create convenience for wearers who want to clean dial sometimes. The front and back crystal are sapphire, which has a great hardness and high scratch resistant performance. Under crystal, the dial looks very clear, especially under sun light, the dial is still clearly readable. 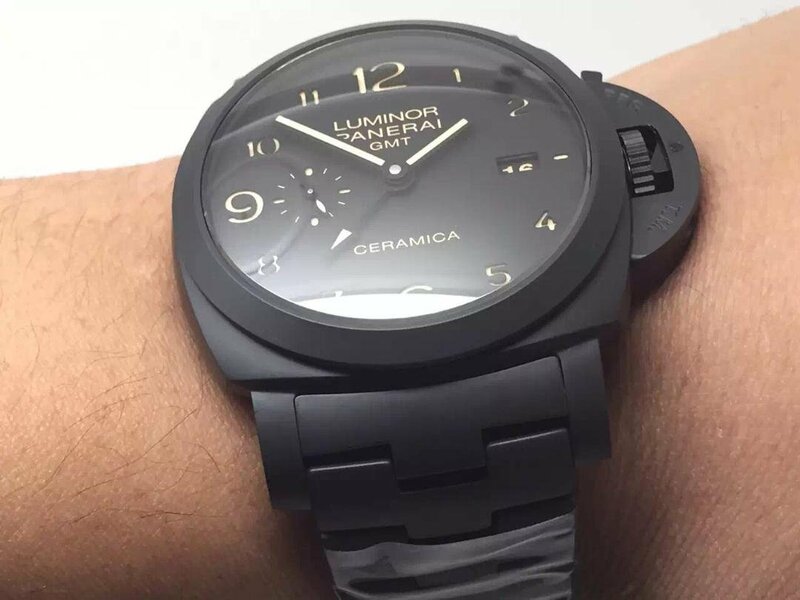 The texture of black dial echoes with the black ceramic case. 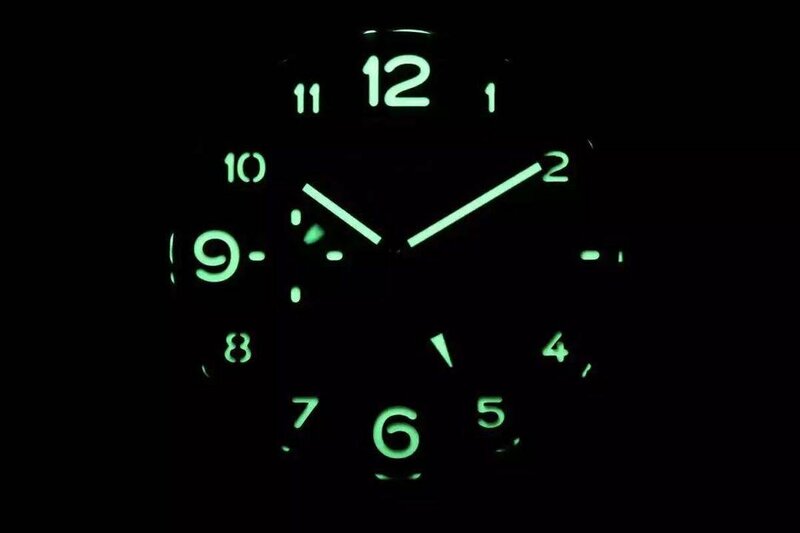 The dial uses classic sandwiched structure like genuine watch, the upper disc is hollow out and the disc on bottom is covered with durable luminous material. Such dial design makes the hour markers look more three-dimensional. By the way, the ceramic crown bridge has corners polished round and smooth, which guarantees a good wearing comfort. 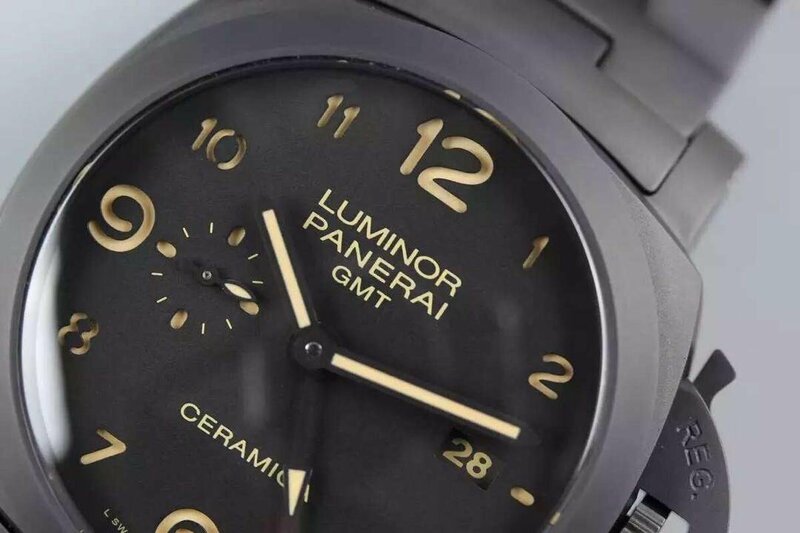 About movement, PAM 438 replica watch uses black movement, its reference is P.9001/B. 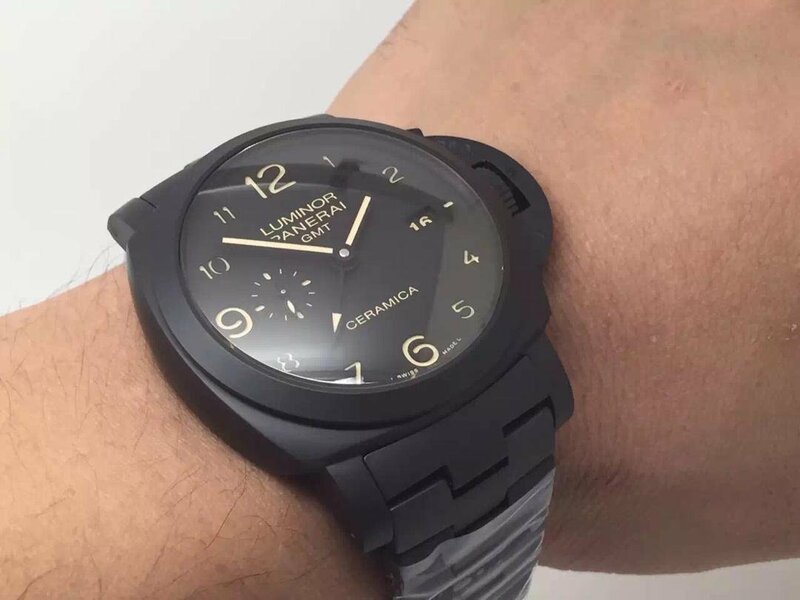 To build an all black watch, to achieve such a concept, Panerai developed this blackened P.9001/B movement. 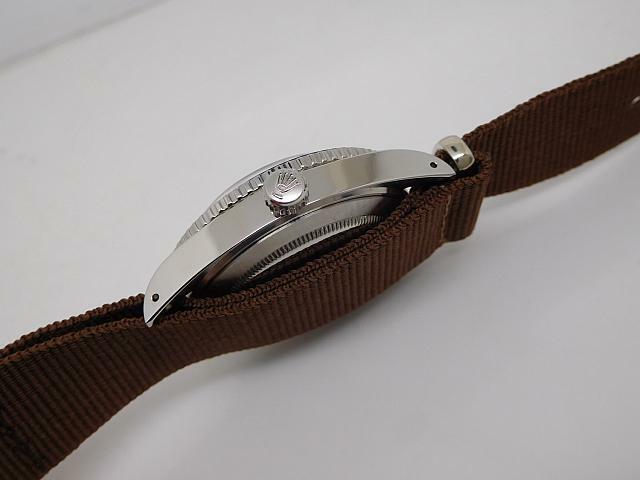 KW factory used a shanghai 7750 to clone this movement, DLC plated movement bridges make P.9001/B the best looking movement in all Panerai replicas. 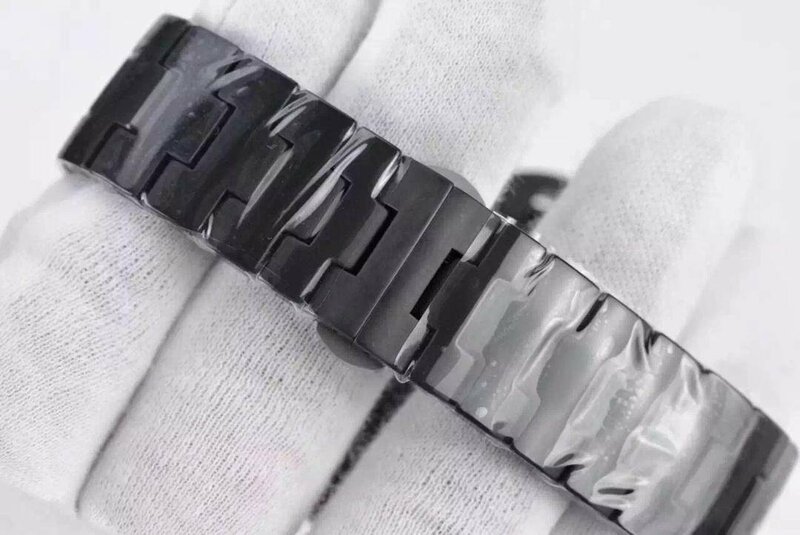 The bracelet is full ceramic made except the black steel deployant clasp. 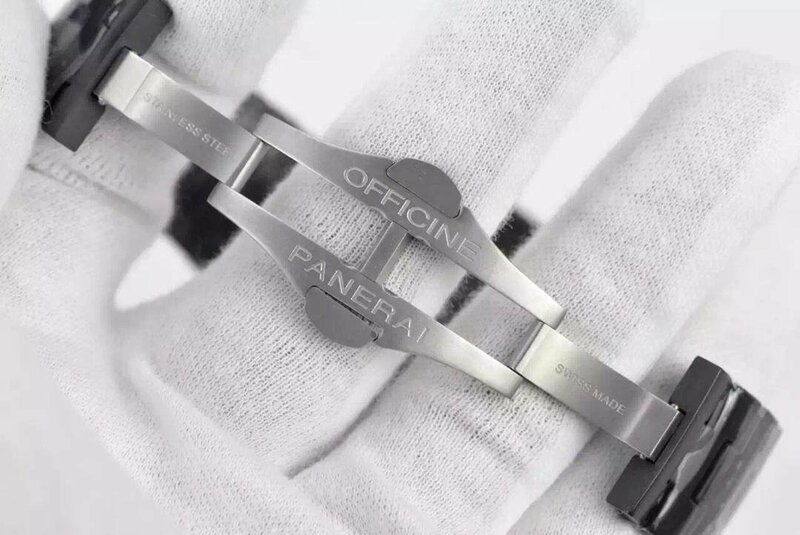 Actually there are still a lot of things needed to be talked on this replica, and it is indeed one of the best-selling PAM replicas in our market, I hope you guys could tell me what’s your opinion about this watch if you have ever bought it. Now the only ceramic watch I still keep in my collection is PAM 438, I love it. In recent months, BP, which is a factory has produced a lot of high quality Rolex replicas, made several vintage Submariner replicas and attracted our attention. Those vintage Rolex like 1680 and 5513 are highly pursued because they have not been in stock in genuine watch market. I always like vintage Rolex and Panerai, I saw there is a close relationship between Rolex and Panerai in old times. 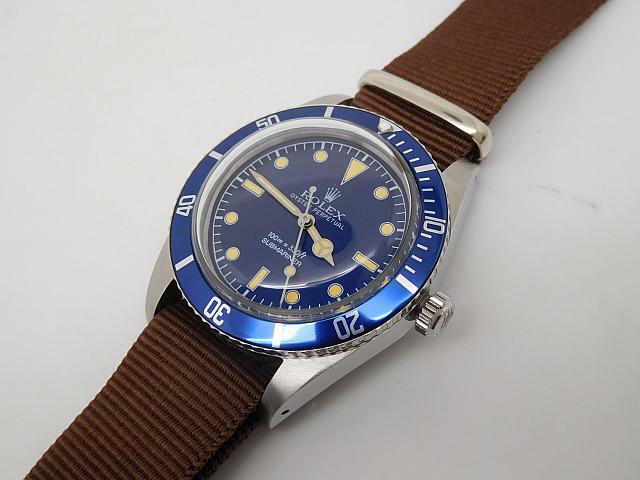 I love vintage Rolex Submariner because most of them are equipped with nylon nato strap, which is my favorite band and could fit my thin wrist perfectly. Besides, vintage Rolex could let me know a lot of myths which you can not find on modern Rolex. 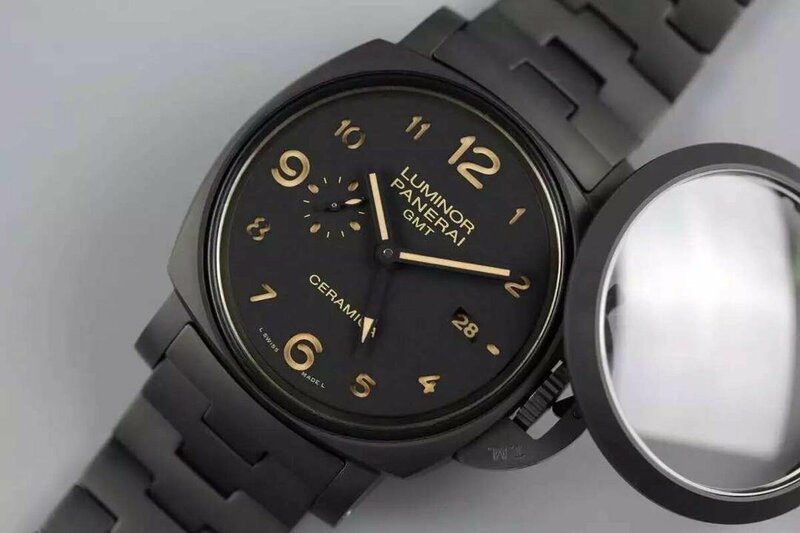 There are a certain amount of people in the world who love searching for vintage watches that already do not exist, so they seek from replica watches market. For example, I have three clients coming from France, the United States and UK, everytime they contacted with me is for vintage Rolex, such as Daytona Paul Newman, Double Red Sea-Dweller or Submariner 1680, one of my clients has bought three vintage Submariner watches from me, and he kept asking for new models once there is. So, we can see how charming these vintage watches are. This time, I will introduce a classic vintage Submariner from BP factory, it is Ref.5508. 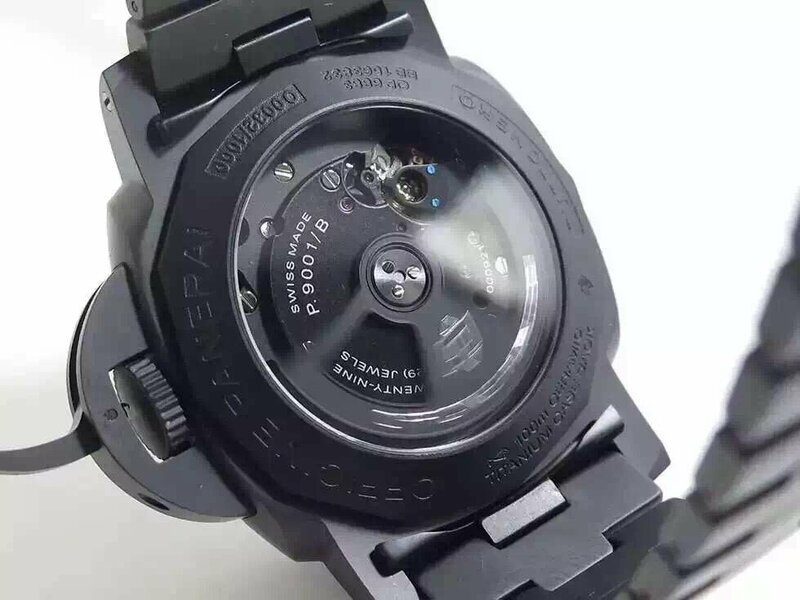 When you first see this watch, you will be attracted by its blue color. yes, both bezel and dial are in blue. With chocolate nato strap, the watch will bring you a visual striking at first. 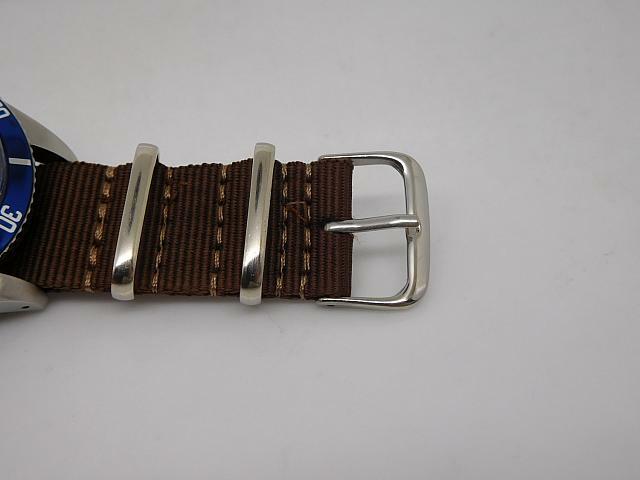 In my experience, every vintage Rolex I saw in replica watch world is either equipped with a rivet steel bracelet or a nato band. If you want both, that is ok. The case is measured to be 38.5mm in diameter, which is a little smaller than modern Submariner. The lugs are brushed, the vintage Rolex crown is also different from modern Rolex’s. Blue bezel insert is metallic made with white printed markers, those bezel markers are not applied with luminescence except the bezel pearl that is filled with white luminous material. 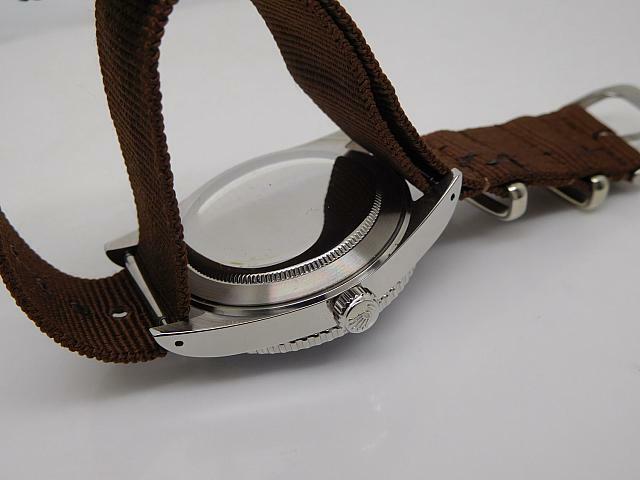 By the way, the bezel clicking tooth is not that as deep as that on modern Submariner watches. 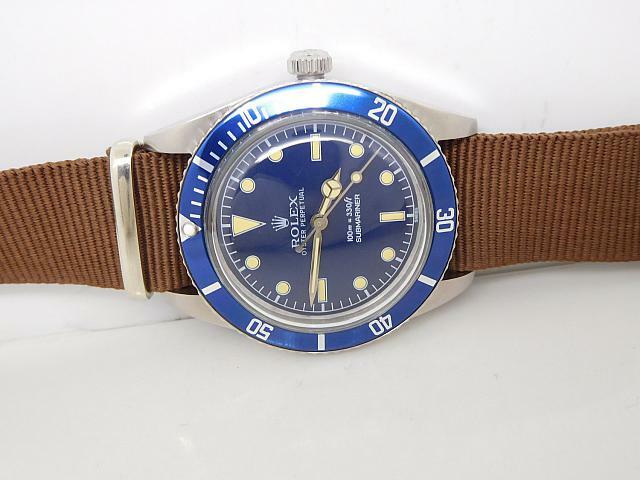 To identify this replica Rolex as a vintage Submariner, you can easily tell by observing is blue dial. Hour markers and hands are applied with patina luminescence, not white. Those patina luminous material will emit strong green light at night. The white printed Rolex Crown is not silver three-dimensional Rolex logo, other printings such as “100m=330ft” and “SUBMARINER” are all white, which forms a high contrast with the blue background. 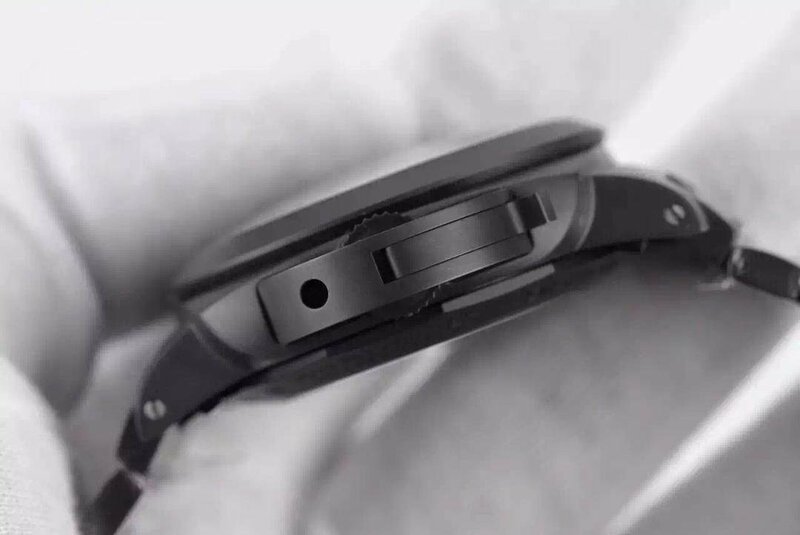 Like we said before, the watch has a chocoate nylon strap, however, the clasp does not have a fastening Rolex Crown buckle. If you requested, I can get you one extra pair of that band. At last, the Rolex vintage 5508 replica watch is equipped with a Swiss ETA 2836-2 automatic movement, so we guarantee that its daily inaccuray will not exceed 3 seconds, we have tested this in factory.